Crooked county supervisors award Don “the Don” Stapley whopping $3.5 million in taxpayer dollars! On of Don Stapley’s two arrest photos. here. Expensive stereo equipment, massages, three family vacations to Utah, Florida and Hawaii, fine women’s clothing from the nicest stores in NYC to name a few. Stapley was indicted not just once, but twice, by grand juries on multiple felony and misdemeanor counts. Using taxpayers’ money, he hired the best, most connected attorneys to the judiciary and State Bar, who claimed that Sheriff Arpaio and his attorney Andrew Thomas were on a political vendetta. We’ve still never been able to wrap our heads around the “political vendetta,” since all three are Republicans.Some believe Stapley has a vendetta against Arpaio for busting his brother in a prostitution sting in the midst of this. Stapley won, and bilked the taxpayers out of millions, getting him off the hook and then getting Thomas disbarred. Meanwhile, he and his cronies have been handing out “settlements” for “stress” over being prosecuted. Stapley’s former business partner Wolfswinkel, a convicted felon, got $1.4 million awarded from the supervisors. The supervisors awarded Stapley’s secretary $500,000. Wonder what kind of stress she went through? There may be a light at the end of the tunnel. Steve Chucri bravely announced he would run for Stapley’s seat a couple of years ago – even though Stapley was still in office. Shortly thereafter, Stapley revealed he would not be running for reelection. Chucri was the lone voice on the board who spoke up against the $3.5 million award to Stapley last week, saying it should be decided by a jury. We need to keep cleaning up the supervisors’ office. Until the rest of them are removed and replaced with honest people like Chucri, the payola and political attacks will continue – on your dollar. JUST WENT THROUGH THE ROOF ! ! ! ! Just saw an infuriating story on CBS 5 Local newscast. The obviously corrupt Maricopa County Board of Supervisors is once again nailing the taxpayers to tune of millions (7 MILLION) in rewards to themselves and friends in another attempt to smear Sheriff Joe Arpaio and Andrew Thomas. I was LIVID when I saw Supervisor Kunasek say taking the case to court was not worth the risk when HE KNOWS DARN WELL that a Federal GRAND JURY looked at ALL the evidence these losers presented against Sheriff Joe and Andrew Thomas and they declared there was NO REASON TO INDICT. It is the Board’s Duty to defend the taxpayers, not crooks within their walls. I think the MCBS KNOW what would happen if the truth gets out. I am sick to my stomach that we can’t get any news source in the valley to REPORT the facts on these ridiculous awards of OUR money to shady operators. I believe every citizen of Maricopa County should DEMAND that AG Horne investigate the behavior of ALL parties in this case. I cannot sit still for this outrage and no one else should either. We also need to find some qualified candidates to run for the Board so we can get some accountability asap. Corruption is KILLING our Republic, don’t sit still for it. Let’s get the Courts and more importantly a JURY involved with this matter. I am tired of the One-Sided assault on our sensibilities. This is terrible. I thought once that goofy Stapley was out of their things would be different. So many forces to fight. They always pay off – that’s why they get sued so often…..after all, it’s not THEIR money — it’s ours!!! 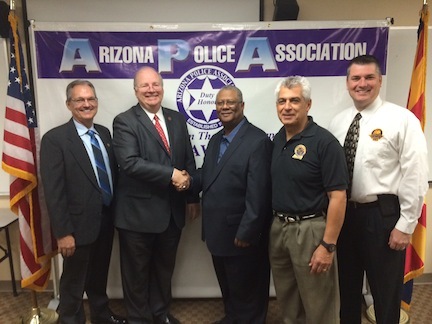 In a joint press conference with the Phoenix Law Enforcement Association, the Arizona Police Association announced today their endorsement of House Speaker Andy Tobin for United States Congress in Arizona’s 1st Congressional District. The Arizona Police Association and the Phoenix Law Enforcement Association represent over 11,000 local, county, state, and federal officers in the state of Arizona. Dinner will be served at 6:30pm and speakers will start at 6:45pm. This is a family event, and all members of your family are invited. Will Democrat Ron Barber Reimburse Taxpayers after Using His Office for Campaign Purposes? PHOENIX – Robert Graham, Chairman of the Arizona Republican Party, demanded today that Democrat Ron Barber reimburse the federal government for the taxpayer money he spent on his reelection campaign. Graham noted that Barber reportedly has more than $750,000 in campaign funds available — funds that should be used to repay the government for using federal funds for his personal campaign. Graham noted that Barber could take the initiative and reimburse the government for the taxpayer funds used to support his reelection efforts when Barber sent out a campaign flyer, but he still intends to ask the Speaker of the House John Boehner to have the U.S. House Committee on Ethics investigate whether Barber’s actions merit disciplinary action. The Committee recently convened to investigate eight members of Congress — including Raul Grijalva of Arizona and Charlie Rangel of New York — who had been arrested by police in October after repeated warnings against obstructing others and “blocking passage” during a protest in Washington, DC. Rangel had been investigated previously by the Committee and found guilty of 11 charges relating to his finances, which led Congress to vote to censure him and require him to pay restitution in 2010. In October the Committee deemed their proceedings resolved after the Grijalva and Rangel paid a fine to have the protest charges dropped. “Americans are just sick and tired of this kind of unethical behavior in Congress, and it’s hitting close to home now that a second Democrat from Arizona is having trouble with his ethical conduct,” Graham added. The Committee on Ethics of the U. S. House of Representatives has published their rules prohibiting members from using official resources for campaign and political purposes here. Scottsdale, AZ (Dec 16th, 2013) – In an effort to reduce the regulatory burden and reduce costs on Arizona businesses, Rep. Michelle Ugenti, R-Scottsdale, has introduced legislation that will create greater accountability of county government. House Bill 2013 is loosely modeled after the Arizona Administrative Procedures Act which governs the process state agencies must follow when creating rules and regulations they impose on Arizona businesses. Ugenti first introduced this legislation in 2012, at the request of many members of Arizona’s business community, to provide them with more certainty and greater input in the development of county regulatory policies. As a result of that effort, in 2013 Maricopa County in conjunction with various stakeholders made several modifications to its regulatory process resulting in greater transparency, additional stakeholder input and expedited processes. Last session Ugenti sponsored legislation to apply the model created by Maricopa County to the other 14 counties in Arizona. Businesses all across the state should benefit from a process that is less complicated, less costly and more predictable. “I am appreciative that the Maricopa County Board of Supervisors recognized the merits of what was being proposed and acted to improve their regulatory process for Arizona’s business. They recognized the value in working with the regulated community to improve transparency, reduce costs and increase accountability. This legislation is worth fighting for so that businesses all across the state receive those same benefits,” Ugenti said. Many in the business community agree with her. The National Federation of Independent Business, a voice for small business, gave Ugenti’s voting record on business issues the highest score possible in 2011 and 2012, the most recent years available. Others who have supported this legislation include the Arizona Chamber of Commerce and Industry, Greater Phoenix Chamber of Commerce, and the Arizona Chapter of Associated General Contractors. I have continued my pledge to eliminate nonessential spending and the resulting burden on the taxpayers with my most recent suggestion at the December 3, 2013, Board of Supervisors meeting. Agenda Item 15, Resolution 2013-109 authorized the issuance of $58 million in Certificates of Participation debt (COPs) to fund additional construction on the Public Service Center (previously known as the Pima County Justice Court/City of Tucson Municipal Court Complex). Certificates of Participation debt may be issued with only a Board of Supervisors majority vote – voter approval is not required. In the 2004 bond election, voters approved $76 million for the “so called” Pima County Justice Court/City of Tucson Municipal Court Complex. Since this election, County Administrator Chuck Huckelberry has stated the $76 million would only cover the shell construction of this courthouse. Voters weren’t aware they would eventually have to pony up more cash to pay for interior finishes. The City of Tucson had agreed to contribute $18 million to the construction; however, without a signed Intergovernmental Agreement, the Tucson City Council chose to withdraw from the project in November 2012 – eight years after the bond election. This left Pima County to make a choice:Cancel the project or go it alone. The Board chose to move forward with the project despite the added burden of bearing all construction costs. I presented my argument to my fellow board members suggesting the County should lease the additional space to an outside party versus investing more taxpayer dollars in the courthouse. My argument to the Board was it would be wiser to lease the remaining area to an outside entity to provide their own improvements which could be a winning scenario for the taxpayers. This option would have allowed for the interior improvements to be completed at the cost of the tenant and at the same time Pima County would have increased revenue by leasing the excess space at the current market rate. Despite my argument, the Board majority voted to use the building as collateral for an anticipated amount of $58 million in COPs. In effect, the Board authorized borrowing an additional $58 million on top of the $22 million previously invested from the General Fund in 2011 thereby overrunning the original bond amount presented to voters by $80 million. This is more than a 100% overrun of the original bonded amount voters approved for this court complex. Pima County will now repurpose the space to house the Pima County Assessor, Treasurer, Recorder, and Constables. The issuance of these additional COPs will fund all interior tenant improvements for the remainder of the courthouse along with parking facilities. I voted against this Resolution to issue more debt. My argument is the movement of County offices to this facility is not necessary or prudent at this time and any additional space improved should be leased at market rate. Pima County currently has more than 3.5 times the debt of all other counties in the State of Arizona combined as of November 21, 2013. Source: Huckelberry, C.H. Memo to the Pima County Board of Supervisors, Resolutions Relating to Debt Issues, 3 December 2013. Supervisor Ally Miller represents District 1 on the Pima County Board of Supervisors. Supervisor Miller began her term on January 1, 2013. Oro Valley – State Representative and congressional candidate Adam Kwasman commissioned McLaughlin and Associates to survey likely general election voters in Arizona’s First Congressional District. A summary of the results can be seen below. 1. State Representative Adam Kwasman is statistically tied with the incumbent, Ann Kirkpatrick, who is dangerously far from the margin needed for re-election. Among those most likely to vote, 42% preferred Kwasman and 41% selected Kirkpatrick. Overall, 42.7% of all likely voters chose Kirkpatrick to 40% who preferred Kwasman, a statistical tie, with eleven months remaining in the election. 42.7% is a dangerously low level of support for any incumbent. 2. Kwasman has nearly unlimited room to grow; Kirkpatrick, with 92.7% name identification, is unlikely to increase her numbers. Kirkpatrick is nearly universally known after her three races for Congress. Notably, she has fallen far from the 48% share of the vote she won in 2012. Kwasman is known by only 23.7% of the voters. After three elections for Congress, only 23.7% of the voters will definitely support Kirkpatrick. 4. Voters overwhelmingly prefer a Republican check on the president to a Democrat who will hand the president a blank check. By a margin of 53.3% to 37.7%, voters selected a Republican member of Congress who would serve as “a check and balance to President Obama” versus a “Democrat who will help President Obama pass his agenda.” This is unsurprising, in light of the President’s 40.7% – 56.7% job approval/disapproval rating. Kirkpatrick, who famously said that she would not second guess this President, has positioned herself sharply at odds with her constituents. Ann Kirkpatrick is in greater jeopardy of losing her seat than previously thought. Though nearly universally known, her support is far from what is necessary to secure another term. All of this is predicated on the same turnout model that elected Kirkpatrick in 2012. If Republican turnout increases as a share of the electorate, as it has in previous midterm elections, then the above numbers grow considerably worse for Kirkpatrick. Methodology: This survey of 300 likely 2014 general election voters in Arizona’s first congressional district was conducted on December 9th and 10th, 2013. All interviews were conducted via telephone by professional interviewers. Interview selection was random within predetermined election units. These units were structured to correlate with actual voter turnout in a general election. This poll of 300 likely 2014 general election voters has an accuracy of +/- 5.7% at a 95% confidence interval. For more information about Adam Kwasman’s campaign for Congress, please visit www.AdamKwasman.com. Is GOP Dominance Responsible for the Democrat Party’s Failure to Field Candidates? PHOENIX – After listening to the Democrat’s only candidate for governor of Arizona call in to a Phoenix radio station from the East Coast this week, and hearing him trying to defend his candidacy, Arizona Republican Party Chairman Robert Graham suggested that the state’s Democrat leaders apparently have given up trying to compete with Republicans in the state’s top race. “There is no competition within the Democrat Party, their ideas and their candidates aren’t being vetted and tested — their single candidate for governor isn’t even listening to Arizona voters because he’s campaigning out of state — and voters are getting less and less interested and even further disengaged as this trend continues,” Graham added. Graham previously described DuVal as “uninteresting” to which DuVal responded by sending Graham a case of beer. Republicans hold a five percentage point advantage in voter registration and enjoy an eight point advantage in voter turnout, and every elected statewide officer in Arizona is a member of the Republican Party. Phoenix, AZ, DEC. 10, 2013—Current Secretary of State and former Senate president Ken Bennett is the early favorite in the upcoming Republican primary for governor, according to the latest poll from Susquehanna Polling & Research. He leads with 20% of the vote in a potential 6-way primary against State Treasurer Doug Ducey (8%) and Mesa Mayor Scott Smith (6%), who is still an undeclared candidate. Both Christine Jones, former GoDaddy attorney and Andrew Thomas, former Maricopa County attorney, have 4% of the vote each. Al Melvin, a current state senator from Tucson is last at 2%, while 53% remain undecided. “Given the high undecided, it’s still way too early to predict a victory for anyone,” Jim Lee, President of Susquehanna Polling & Research said. However, because Bennett is the favorite with the Latter Day Saint (LDS) community and the tea party, his support will be harder to crack than other business and establishment type candidates. On the other hand, both Ducey and Jones are expected to raise millions of dollars to increase their statewide name ID (not including IE’s), while Bennett is relying on public funds. To their advantage, both Ducey and Bennett have experience running a statewide race. However, there is also a chance they will split the conservative vote, opening the door for Jones. “In a six-way race with at least four of the six considered formidable, whichever candidate gets 25% to 35% of the vote could be the winner in a low turnout type election typical of primaries,” Lee said. Regardless of who wins the primary, two potential matchups of GOP candidates against presumptive Democratic nominee Fred DuVal shows both Bennett and Ducey with small leads over their Democrat opponent. Bennett leads DuVal 38-33, while Ducey leads DuVal 36-33. Both Bennett and Ducey do equally well against DuVal with Republicans, at 64-10 and 60-9, respectively. One of DuVal’s advantages could be the absence of a contested primary and the ability to harness resources, while a competitive and hotly contested GOP field could produce a damaged GOP nominee. “Nonetheless, the closeness of both races show that the governor’s race next November could be very competitive regardless of whom the nominees are,” Leslie Kelly, Regional Director of Business Development said. Another question that may give insights into the race is the poll’s right direction/wrong track question. Currently, 49% say Arizona is headed in the wrong direction, while 39% say the state is on the right track. This negative result could suggest a sentiment for change, or some discontent with the status quo which potentially benefits DuVal and/or the Democrats if they campaign as agents of change with a new direction for the state. Republicans say the state is going in the right direction by a 51-36 margin, while Democrats lean “wrong” track by a 66:20 or better than a 3:1 margin. Independents are nearly divided (42-49 in favor of wrong track). The margin of error for a sample size of 600 interviews is +/-4.00% at the 95% confidence level. © Susquehanna Polling and Research, Inc. is a nationally known survey research and polling firm for both candidates for public office (GOP only) as well as various corporations, association clients and media outlets. Voter Survey Service (VSS) is a division of SP&R and conducts surveys in more than a dozen states including Pennsylvania, Arizona, Delaware, New York, New Jersey, Maryland, North Carolina, Florida, Colorado, Missouri, Iowa, West Virginia and others. SP&R recently served as the pollster for Mayor-elect Don Guardian in his historic upset victory in the 11/5 mayoral election in Atlantic City, New Jersey. More information about our firm can be found at www.susquehannapolling.com.